Our Split was built in 1992, and though the home had all of the main points we were looking for (attached garage, kids have their own rooms, open concept, large yard), the decade of its construction was alive and well. We opted to paint the ceilings a crisp white to help lighten the space, instead of scraping it off. This decision still requires a process and plenty of technique though, because painting a popcorn ceiling can be a bit tedious. If the texture gets too wet, it will fall off. So, you can only paint one swipe of the roller at a time, one coat at a time. Miss a spot? Cover with the next coat. Avoid painting the same area twice in a row. Make sure the previous coat is completely dry before applying the next. Landen's ceiling is currently awaiting its 4th coat of white paint to achieve the coverage I want. When we moved in back in 2012, the kids were still pretty young. Madelyn had just turned 1, and Landen was 5 (I know, don't even talk to me about how fast time passes); and we wanted to keep the kids together on the same floor. That meant, Landen would sleep in the master. Still, the set-up has proven ideal for them because (when they aren't fighting) they lean on each other during a thunderstorm or when Madelyn has a diabetes episode. 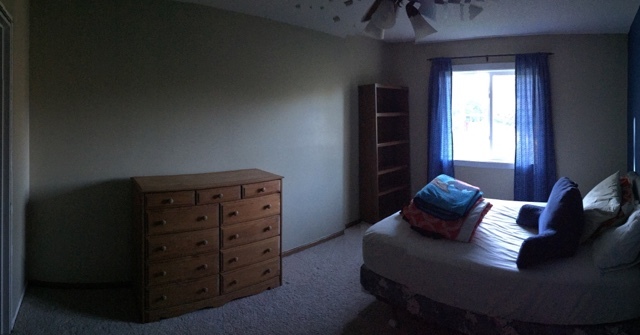 I snapped the above panorama photo of Landen's room once we moved most of his things out. There isn't a whole lot to do here: finish his ceiling, touch-up his blue accent wall and paint the other 3 walls the same gray as Maddie's; replace the baseboards with white ones and install white 6-panel doors. Then, we'll finish decorating his bedroom and hang his wall art. From there, we'll have to pick from the never-ending to-do list of home updates we've discussed. None of it is major, as we intend to keep the footprint as it is. We've talked about refinishing all of the cabinetry, add fresh paint throughout, and perhaps new wood floors in the kitchen. I want to add wood to the support beam in the great room to warm up the space. 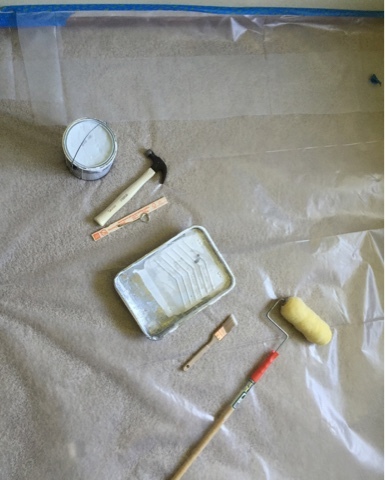 It's a lot of DIY, sweat equity - but if there is one thing I learned as we exorcise renovate our split, calling in the professionals is still considered DIY. Knowing when to step back is just as important a skill as any.